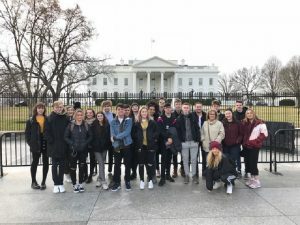 A Level Government and Politics Students recently went on a visit to Washington DC to help supplement their understanding of US Government. The trip took in the major institutions of the federal government –the US Capitol building for a guided tour of the House of Representatives and the Senate, and also the White House and the US Supreme Court. In addition they were able to visit several notable museums and galleries, as well as, a guided tour of Arlington Cemetery including the tomb of the Unknown Soldier and the John F Kennedy memorial. They also got an opportunity to enjoy a variety of American cuisine and a very enjoyable basketball game as well.